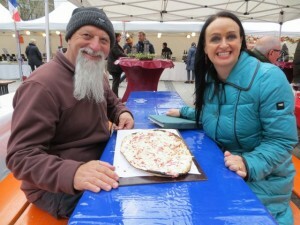 The reason we are heading to Frankfurt is to visit our old friends Andre Haermeyer and his wife, Tonya Stevens. We’ve known Tonya since the good old days of the Fitzroy Football Club and got to know Andre well when he was police minister in our home state in Australia. 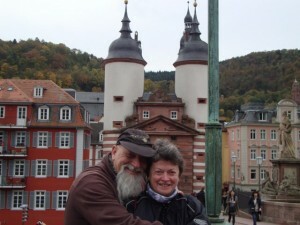 They moved to Germany about four years ago and have settled in to life in this thriving community. 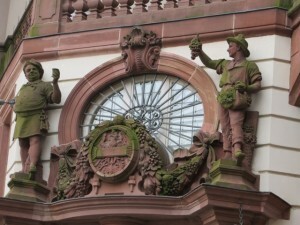 Most people only stop at Frankfurt’s airport on the way to other places (we’ve been guilty of this in the past) or come to the city on business with the finance sector. What they miss is a city filled with wonderful architecture and history. Tonya has taken to her new home with a passion usually reserved for long-time residents. She takes visitors on walking tours of the old city giving them an insider’s look at what survived WWII and what has been created out of the rubble. 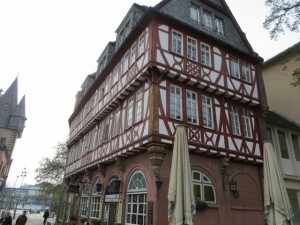 There is no hiding from the past in Frankfurt. 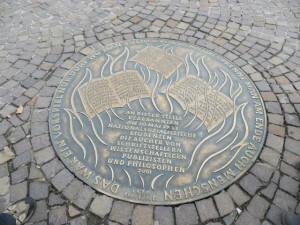 In the middle of the main square is a memorial that marks the day the Nazis burned the books in 1933 – it was an ominous sign of things to come. 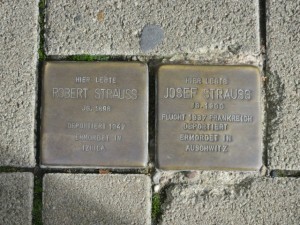 There are markers showing where Jews, rounded up and removed from the city and taken to the death camps, once lived. 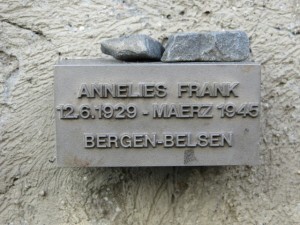 And the wall around the old Jewish Cemetery bears the names of those 12,000 Jews, among them Anne Frank and her family. 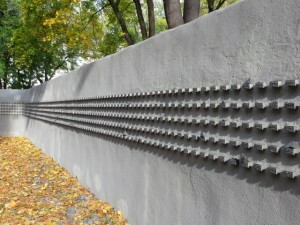 It is an evocative way to ensure we never allow such atrocities to occur again. 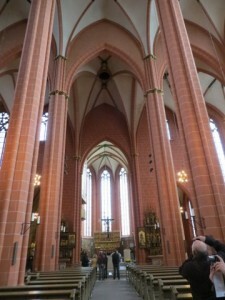 The city was bombed heavily during the war but the magnificent cathedral survived. 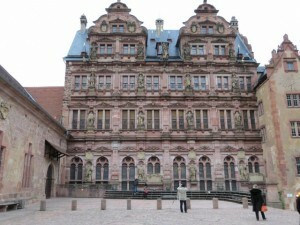 Some of the surrounding buildings were also untouched – others have been carefully rebuilt to restore the beauty to the city. 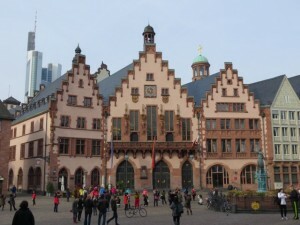 And Frankfurt is a place of great food with regular farmers markets held in the squares and a marvellous fresh food market. 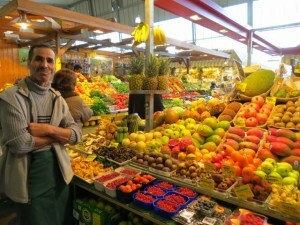 This fruiterer helped Tonya learn German in her early days in the city. 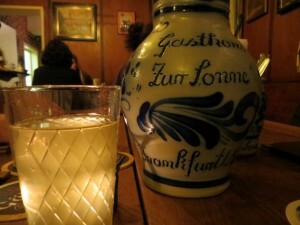 The local delicacy is Apple Wine – always served in ceramic jugs and drunk from stylised tumblers. 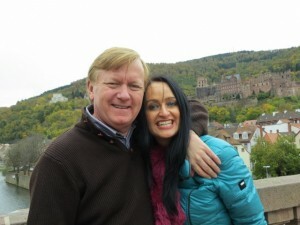 Andre and Tonya took us on a day trip to Heidelberg – one of the few cities that wasn’t bombed during the war. Its narrow streets and squares are alive with tourists and students from the local university. 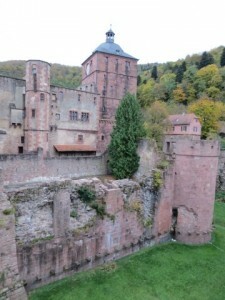 It is all overlooked by the amazing castle which, like most, was built in stages over centuries. We can’t thank Andre and Tonya enough for looking after us so well. 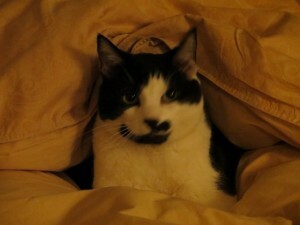 And special thanks have to go to their two amazing cats Munchy (who enjoyed exploring our bed) and the camera shy Paris. It was hard to say goodbye. That is the downside to a journey like ours – constantly saying goodbye to new friends and old. It was so wonderful having you both here! We had such a great time with you and we are so glad you enjoyed Frankfurt and got to see the “real Frankfurt” We all miss you here- Munchy and Paris too. Until then enjoy your amazing journey.